Jewish group hits Temple University for backing professor fired from CNN after he endorsed elimination of State of Israel. Temple University has refused calls to fire a controversial professor, even after CNN cut ties with him over his endorsement of anti-Israel violence and calls for the elimination of the Jewish state. 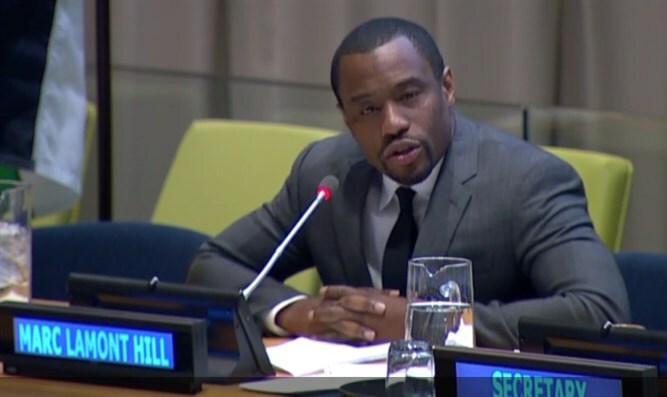 Marc Lamont Hill, a veteran commentator for CNN and a professor of urban education and media studies at Temple University in Philadelphia, blasted Israel during an address at an event in the United Nations earlier this week, accusing the Jewish state of ‘cleansing’ the country of its Arab population, and gave his blessing to the anti-Israel Boycott, Divestment and Sanctions (BDS) movement. At an anti-Israel event in the United Nations on Wednesday, hosted by the Committee on the Exercise of the Inalienable Rights of the Palestinian People, Hill called for the termination of the State of Israel, and its replacement with a Palestinian state ‘from the River to the Sea”. Justice requires a "Free Palestine from the River to the Sea," said Hill, adding that violence against Israelis must be legitimized, accusing Israel of “ethnic cleansing”. “We must promote nonviolence at every opportunity, but cannot endorse narrow politics that shames Palestinians for resisting, for refusing to do nothing in ethnic cleansing." Hill’s comments sparked a wave of criticism and accusations of anti-Semitism. Hill later said via Twitter that he did not back anti-Semitism, and denied that his comments constituted an endorsement of violence. On Thursday, CNN announced that Hill was no “no longer under contract” with the cable news giant. But Hill’s other employer, Temple University, appeared to be unwilling to terminate him over his remarks at the UN event. In response to the controversy surrounding Hill’s anti-Israel comments, a spokesperson for the university told Fox News that Temple University ‘acknowledges’ his “constitutionally protected rights to express his opinion”. On Friday, the National Council of Young Israel pressed Temple University to follow CNN’s example in terminating Hill, saying Hill’s address at the UN event was only the “latest in a long line of anti-Semitic comments”. Young Israel hit Temple University for what it called the college’s “disingenuous” response. “While we are grateful that CNN did the right thing under the circumstances, it is extraordinarily disingenuous for Temple University to summarily try and distance itself from Marc Lamont Hill,” said the National Council of Young Israel.